Home » » Honey Honey Honey! 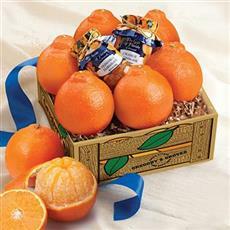 Buy one 10-piece gift of HONEY Tangerines for only $34.99. Get a 10-piece gift of HONEYbells absolutely FREE! Plus, FREE HONEYbell Jellies! And the entire gift ships for FREE! All items ship in one box to the same address. Please note: you may not use a promo code for an additional discount on this product. All items ship in one box to one address. Free shipping in the 48 contiguous US only. I have order this product 2 years for my friends birthday. She gets them when promised, excellent condition, excellent customer service, excellent fruit and the quality exceptional! Hello! 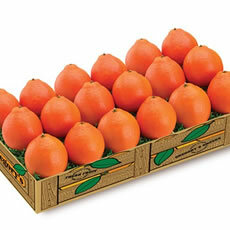 I recently bought the valentine special with the tangerines & the honeybells. I was very impressed with the honeybells but the tangerines not so much. They had no flavor at all & they were not juicy either. Just an FYI. I understand that Mother Nature " happens" & we can't always have everything perfect. Thank you so very much! loved the honey honey! sweet juicy and great snack! I also appreciated the little extra treats. Honeybells - always perfect, juicy and sweet. I order them every year. Hello! I received my order of honey tangerines & honeybells. I received them before my delivery date which was awesome! While the honeybells were awesome & juicy I was not impressed by the tangerines at all. They didn't have much of a flavor like the honeybells. This does not mean I won't be ordering from you again I just won't order the tangerines! Thank you! They were delicious. Best Valentines day present ever! I have been ordering Gregory's oranges for yeas and have never been disappointed. Luv 'em! Sent the citrus to a colleague in WI as a thank you. He must have thanked me 12 times in his voice mail message! They arrived in perfect condition, but very small. They were not as sweet as I remembered HBells to be. The service, convenience and most of all the fruit is truely spectacular. My friend said most of them were great, but two were not good. receiver of our gift loved it and said they are really delicious. Received our orders on time and the fruit was excellent. I gave the honey bells as a gift to friends. They arrived sooner than expected (great!) & they thoroughly enjoyed them. Sweet & Juicy!! My parents in NY have loved every piece of fruit they have received from Gregory's Groves! I send them for gifts throughout the year! I can't thank you enough! Arrived at time requested, packaged well, was delicious! Is getting pricey, but what isn't? I ordered and received two boxes of honeybells recently. Both boxes had a couple of rotted oranges in them, but the rest were delicious. I am pleased that you do live up to your promise that your products are guaranteed. I have always been pleased with my orders, but in the last order one orange had spoiled. 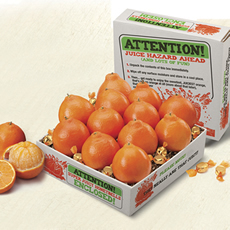 I notified you, and you promptly sent a box of six more oranges as replacement. I could not ask for better service than that. Thank you. I have ordered these for my mother in Masury, Ohio for a few years. They are wonderful. She loves them and that is all that is important. The prices are great. Your products are great, reasonable. Had small problem with 2 pieces. Was reimbursed promptly. Would use next year for the delicious honey bells. The honey tangerines had many seeds. Sweet, but too many seeds to deal with while eating. Great Condition and great taste. I gave this as an anniversary gift, and they absolutely loved it. It got there early - and they were so happy they've thanked me twice for the gift. Having placed two relatively recent Orders: 1 as a Christmas Gift and another as a Valentine's Day Gift, the responses I received from both recipients was "Juice Flying Everywhere" and "Juicy and Delicious". Nothing more needs to be said! Sweet, juicy and fresh. These Honeybells were worth the wait. Don't wait to eat them because you don't want them to go bad on you after a week a so. Package purchased as gift . Recpient family surprised, thankful, and delighted.! I received one box of sugar babies & one box of Honey Honeys ,all was packed very well. The fruit was awesome & so juicy. I will be ordering from your groves in the future. Your prices are very fair and the fruit speaks for its self. Thank you, we really enjoyed the fruit very much! You ship the very best oranges of any that I have ever bought however they always arrive later than I request. The recent shipment was actually a replacement for an order that came with damaged fruit. The new box has excellent fruit, although one piece was again not usable. I do appreciate the replacement on the previous order, and the fruit is delicious. I hope you have this deal next year, what a delicious combination, of the folks I sent this to they raved including myself, not knowing what to expect I know I will order this product next year. I have to say these were decent oranges. Not the best I've ever had but still good. Oranges were good but I thought I purchased a buy one box, get one free.